In many parts of Malawi, including our pilot community Jidi, education is a privilege for some; not a right for all. This includes basic elementary education. 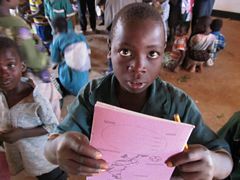 On a national level, Malawi does not have enough schools for everyone. Subsequently, the poorer communities go without schools, or have to make do with walking long distances to the nearest school which is sometimes treacherous during heavy rain seasons. In Gusu, the nearest school is an hour’s brisk walk away. Even those children whose parents have fought against odds to put their children in school, they face the hurdle of having their little ones take the unforgiving trek every single school day. And when they do get to the school, they are confronted with a pupil teacher ratio of 200:1, a shortage of books and other learning materials, and not enough classrooms for all the grades. It is not uncommon have classes under the shade of a tree during dry months, and cancelled altogether in the rain season. It is only to be expected that after decades of these conditions, villages like Gusu have exceedingly high illiteracy rates with some statistics stating 80%, and their children fall prey to more illiteracy, child labor, and early marriages. Although it may be a lost dream for them, the men and women of Gusu want their children to have theirs. We can’t emphasize literacy enough because if a person can’t read or write they have a hard time growing economically because they can’t count or do the books, handicaps learning about modern methods of farming, stunts spiritual growth because they can’t read the Bible, and prohibits a person from understanding basic health issues because they can’t read or understand about various health issues like cholera, aids, and malaria. The first community E3 has targeted to address these issues is Jidi in the Dowa district. There are several projects that we are concurrently working on which include; construction of a primary school with adequate teaching and learning materials, adult literacy, permaculture training, basic health education, microfinance programs, discipleship development, modern farming techniques, and environmental protection. Currently most of the education programs are in their infancy except the primary school and permaculture education. The primary school was completed in 2011 with its first two class’s grade 1 and 2 started in September of that year. Sept 2012 saw the hiring of 5 teachers with grades 1, 2, 3, and 4 in session. Two more teachers for a total of 7 are slated to start in February of 2013. E3 has hired a project manager, Sandram Phiri, to implement and advance the other programs and has hired Dennis Banda as the onsite agriculture manager. Sandram has started the adult literacy and discipleship programs. Dennis is teaching the adults and children permaculture design and farming techniques while implementing a school permaculture garden demonstration site. Dennis is also overseeing the new aquaponics system and reforestation project starting with the planting of up to 2000 fruit and nitrogen fixing trees. Before the school was open approximately 40% of school age children attended school. As of 2013 figures show attendance of 290 children which represents an 80% attendance rate of school age children. The E3 agriculture training is yielding dividends as well. Before training started families were not harvesting enough food to last the year. Since permaculture and other farming practices were introduced many families are now able to harvest not only enough for their own yearly needs but harvest excess food for sale in order to generate income. These families are now able to send their children to secondary school and improve their living environments. The community is excited about the future education prospects for the community. E3 has plans to construct a much needed secondary school which will increase the number of students who can receive secondary education. Currently about 600 children in the Jidi education zone pass the primary education exams that qualify them for secondary school enrolment. Unfortunately only 100 of these students have access to secondary education due to lack of secondary schools. With the construction of a secondary school in Jidi another 150 more students will have access to advanced education. Besides a secondary school, the community has asked for vocational and business training and commercial farming techniques which include animal husbandry. Apart from a literate community, E3 is striving to see Jidi become an empowered, independent community capable of making informed, educated decisions about social and economic wellbeing. A literate community is an informed community which is an empowered community. Currently, financing is sought for construction of two secondary school blocks, education materials such as books, pencils, paper, desks, and teaching materials. To donate for any of these items click here.